No Waiting: Pour any wine bottle directly into the top opening for instant aeration. You no longer have to wait for the perfect taste. BETTER TASTE: Utilizes barometric pressure to provide smoother, softer taste to any wine, increasing the overall value of your wine. ADJUSTABLE SPEED: Offers complete wine tannins taste control with simple twist action 0 - 6 aeration speed level adjustment. ACCESSORIES INCLUDED: Packaging includes a display stand and carry pouch for easy storage and portability. Aerate your wine wherever your celebrations may be. Designed with high-quality acrylic and stainless steel, this wine aerator is the perfect gift for any wine enthusiast. Perfect the taste of your favorite wines using instant decantation and flow regulation technology. This instant aerator provides the instant gratification of a smoother and softer taste for any wine you pour into it. Most importantly, you're in complete control of the taste of your drink with a 7 level aeration speed selection. With simple barometric pressure, the wine aerator allows air to naturally oxidize the elements in your wine to create a better taste. There's no waiting necessary. 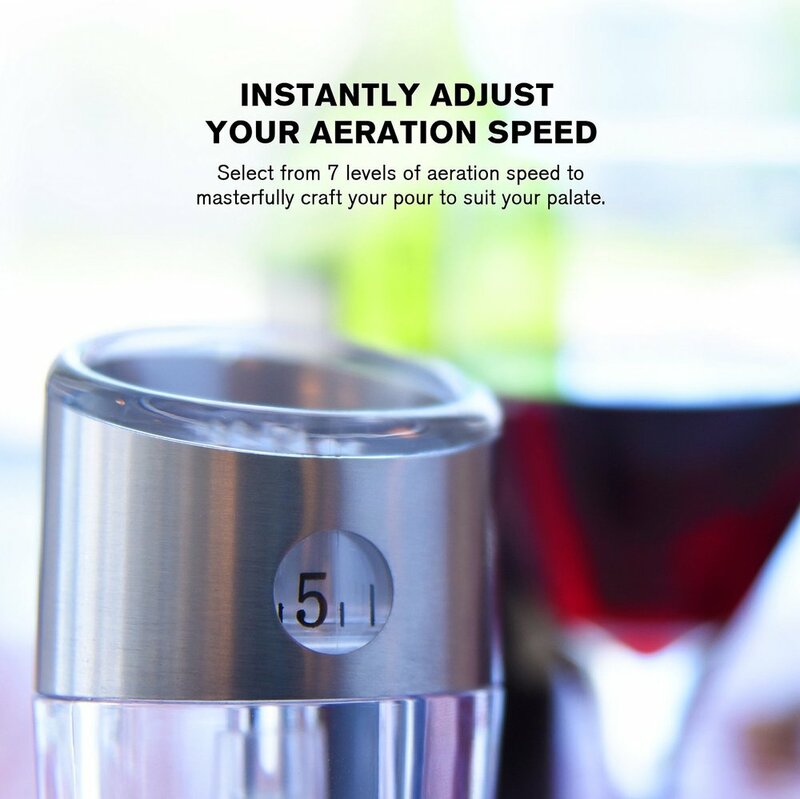 Select the speed of aeration you wish to have by twisting the stainless steel band to display the desired level, hold the aerator over your glass, and pour into the wide wine intake chamber. The aerator will instantly allow your wine to breathe as it flows through the aeration chamber, through the spout, and into your sparkling glass. If a wine bottle is left unfinished, simply recork your bottle instead of letting it go to waste over time in a decanter. Give your wine a taste that's twice as expensive as what you've paid for and bring value to your wine collection.